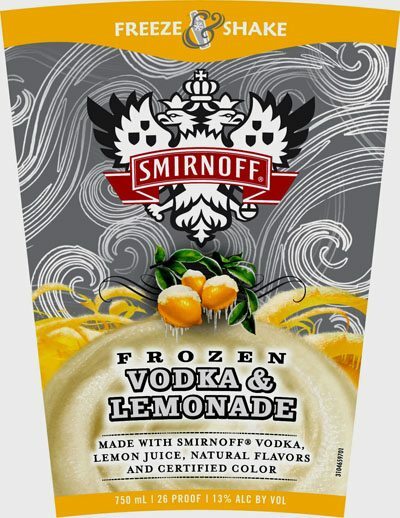 We thought this approval (for Smirnoff Frozen Vodka & Lemonade) was noteworthy because it points out several things. First of all, it tends to show that it’s okay to add a little bit of extra verbiage, to the mandated statement of composition, on a distilled spirits specialty. The required statement is probably VODKA WITH NATURAL FLAVORS AND FD&C YELLOW #5. The one on this label adds a few extra words such as MADE WITH SMIRNOFF. It adds a few other descriptors nearby, at VODKA & LEMONADE. Second, it tends to show it’s okay to put the color details on the back, if the general statement is on the front. CERTIFIED COLOR (general) is on the front and CONTAINS FD&C YELLOW #5 is on the back only. Third, this shows it can take a lot of work and a mighty long time for a big company to bring a product to market. This approval is already about eight months old, and there is no sign of this product on the web or at the indicated domain. Fourth, it’s probably an unusual, pouch-type package and freeze technology, based on the approval, but we’ll need to wait a bit longer to see it. Finally, as with many other Smirnoff-branded products, the references to VODKA are very large, even though it could be said that it’s not vodka. These are fairly technical points, but many of these issues arise often.